Avoiding Crowds on Your Holiday Trip To Japan - When and Where Is The Best? While parts of the year like the cherry blossoms season and snowy winter are popular with most tourists (domestic and international), some people simply want to avoid the crowd. Be it claustrophobia or hatred for long queues, not wanting to caught in a mass of tourists is not unreasonable. To achieve this, one option is to choose a relatively remote area away from all the hustle and bustle. The other method is to choose the time of year with least tourists. We will cover both in this article. From here, “tourists” will refer to both international and domestic tourists unless otherwise stated. Domestic and foreign tourists generally agree. 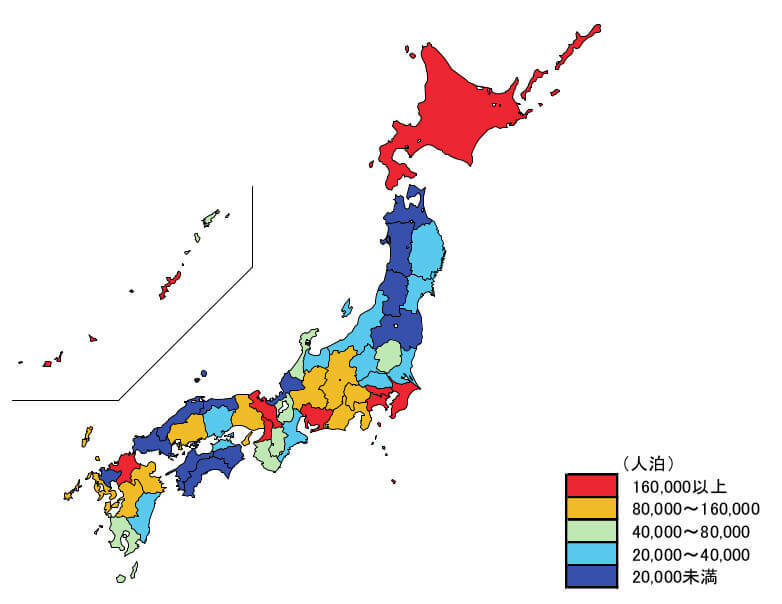 If you look at the map below, the prefectures that need some love include every part of Shikoku, Akita, Fukui, Shimane, and Saga, among others. Don’t be mistaken, there are still many pretty things to see in these places. Clearly, just looking purely at person overnight stays (for the lack of a better word – basically means people multiplied by nights stayed) and a specific part of the year is not very fair. But let us leave that for now. If you were sharp, you might have realised that the difference between the scale of domestic and foreign tourism is huge in the above maps. To confirm that fact, refer to the chart below. You will notice that the monthly total person overnight stays averages about 2+ million for foreign visitors compared to about ~35 million for domestic travellers. Continue looking at the figure above. Summer holidays occur in August, hence the huge spike in domestic (and hence overall) nights stayed in hotels. I hesitate to call March a peak as the high rates might be due demand for temporary accommodations for the massive moving season in late March/early April (the part of the year where people get posted around, graduate or get new jobs). Then again, it would still affect you if you are planning to stay in a hotel. June is not particularly popular, probably in part due to 梅雨 (tsuyu – rainy season). If you decide to go to Japan in June, consider bringing a Samurai Umbrella. January, February and April see lower number of hotel stays too. If, for some reason, you tend to embrace local tourists but want to avoid foreign tourists, the above periods should be avoided. This would mean missing the cherry blossoms, autumn leaves and hot hot summer (not exactly a bad thing). Refer now to the charts below. Occupancy rates = how packed hotels are. Note that 2011 was the year the unfortunate Tohoku earthquake occurred and the months after that incident show significant anomalies for Eastern Japan. So that’s it. To indemnify myself: not every year is the same and experiences vary from person to person. This is meant as a guide and you should look into other factors when planning a trip.